Bubyira Kydyraliyeva. Photo: oDR. All rights reserved. For many years, Bubyira Kydyraliyeva couldn’t share her secret. No one wanted to listen. She wasn’t taken seriously. But Kydyraliyeva was determined to find at least one person who could unravel the tragic story that she has kept since she was 10 years old. In the 1930s, the Kydyraliyev family lived in a KGB dacha. Bubyira’s father Abykan worked at a brickworks there for almost 30 years, building cottages with them. 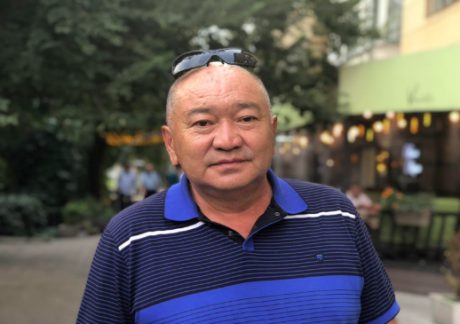 Then he got a job nearby as a janitor in a holiday camp in Chon-Tash, a village 20 kilometres south of Frunze, now known as Bishkek. The complex was run by the NKVD, the forerunner of the KGB. Every evening, Bubyira’s father would walk to the old kiln and pray there. He would come back with tears on his face, warning his family not to speak about what had happened in the dacha grounds. A relative who had lived in the nearby village once pointed out the trucks piled with bed sheets that would drive past in the direction of the dacha. Bubyira’s father said they were probably just returning clean laundry to the dacha complex. Bolot Abdrakhmanov. Photo: oDR. All rights reserved. Abdrakhmanov also got archaeologist Mikhail Moskalev involved in his quest, and in late April 1991 they set off with Bubyira to Chon-Tash. “Moskalev was an enthusiastic detective and demonstrated his knowledge of his subject from the start. The first thing we found was a skull with two holes in it, probably bullet holes,” says Abdrakhmanov. Abdrakhmanov’s superiors were sceptical about the find, unconvinced of its value as evidence of executions. But in those days of Gorbachev’s reforms, attempts to posthumously rehabilitate victims of the Great Terror were under way. In January 1989, the USSR Supreme Soviet passed a directive “On additional measures for the re-establishment of justice towards victims of repression in the 1930s, 1940s and early 1950s”. The Kyrgyz KGB leadership decided to carry out an excavation at Chon-Tash, and unearthed the remains of 12 people in the first day. After two weeks they had found the remains of 138 people. When the archaeologists then started digging deeper, they found belongings typical for the 1930s and 1940s: sweaters, soldiers’ tunics, caps, boots and spectacles. They even turned up a skull with gold teeth. “There were 10 skulls with gold crowns. Who could have had gold crowns on the teeth in the 1930s? They must have been the republic’s rulers,” says Abdrakhmanov. But they weren’t enough to identify the bodies: the most difficult thing – establishing identities – was still ahead. It was then, in September 1938 that Chingiz Aitmatov’s life changed forever. Aitmatov’s father, Torekul Aitmatov, a high-ranking Kyrgyz Communist Party official, was arrested and expelled from the Party. The future famous writer was then 10 years old. Torekul’s wife Nagimey was later informed that her husband had been condemned to 10 years in the camps “without right to correspondence”. The Aitmatov family never had any further news of him. As children of an “enemy of the people”, Chingiz Aitmatov and his sister Rosa were subject to persecution themselves. It was only in the mid 1950s, the years of Khrushchev’s “Thaw”, that Torekul Aitmatov was recognised as a victim of Stalin’s repressions and posthumously rehabilitated. His body was, however, never found. “We spent so many years searching for his grave and had almost become resigned to never finding it,” Rosa later wrote in her memoirs. Chingiz Aitmatov rose to fame in the years after the fall of the USSR, and it was then that Bolot Abdrakhmanov found several documents along with the bodies of four people who had been executed. The indictments included Zhuzup Abdrakhmanov, head of the Soviet of People’s Commissars of the Kyrgyz SSR, and Torekul Aimatov. 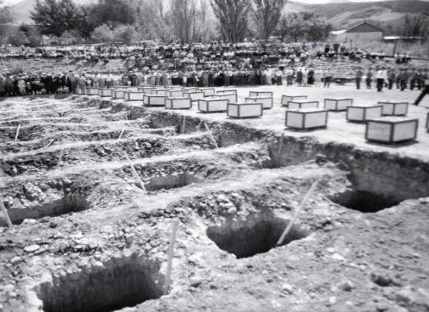 After this, investigators were able to find the remaining indictments in archives, and traced the identities and execution dates of those buried in this mass grave with their help. The dead included not only party and government figures, but also simple collective farmers, scholars and semi-literate labourers, engineers and cowherds. One body out of the remains of 138 people, a middle-aged woman, remained unidentified. Sarcophagi prepared for burial, 30 August 1991, Ata-Beyit. The Kyrgyz authorities carried out individual reburials at the grave site. In late August 1991, the Ata-Beyit memorial complex was opened to preserve the memory of the victims of Stalin’s Terror. “What’s interesting is that neither Asankulov [the KGB boss who ordered the excavation of the mass grave – ed. ], nor any KGB officers, nor Bubyira Kydyraliyeva nor I myself were invited to the ceremony,” Abdrakhmanov tells me. The KGB man recalls how after the official opening ceremony Chingiz Aitmatov gave interviews to Moscow TV channels, in which he declared that “some old woman” had decided on her deathbed to reveal the secret of the disappearance of victims of the Great Terror to a KGB captain. Reading this in the newspaper headlines, Abdrakhmanov was no less disconcerted than Kydyraliyeva herself, who had been buried prematurely by the media. Even her family believed the story, rushing to her home for her funeral. Few realise that some of those buried at Ata-Beyit were themselves complicit in political repression. According to historian and philosopher Eleri Bitikchi, “it’s not widely understood that among the people affected by the events of 1937-1938 were those who were involved in earlier official acts of terror, especially during the period of collectivisation.” This was the fate of Ivan Lotsmanov, the Kyrgyz SSR’s People’s Commissar for Internal Affairs in 1937-1939, who was shot in 1940. In her memoir, Roza Aitmatova writes that the people executed during the late 1930s were “exceptional figures, people who genuinely believed the USSR to be a just society and took on themselves the burden of and responsibility for the re-establishment of Kyrgyz nationhood and the salvation of the Kyrgyz people from the horrific consequences of their 1916 revolt.” Eleri Bitikchi says that today, other burial sites raise little interest from the Kyrgyz government: Ata-Beyit has become a cult space for its state elite, whilst lower status victims are buried at other sites. Baktygul Zhumakadyr kyzy. Photo: oDR. All rights reserved. There is supposedly another mass grave in the suburbs of Karakol, Kyrgyzstan’s fourth largest town. 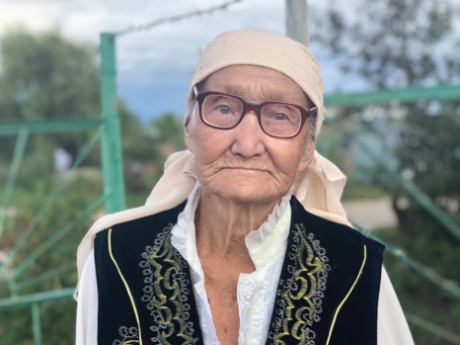 But according to Baktygul Zhumakadyr kyzy, who works at the Issyk-Kul regional library, it attracts little public interest: “We also hold a list of 2,000 people who were shot in the region at the height of the Terror, but unlike those at Ata-Beyit, they weren’t buried at a single site and their bodies haven’t been found”. Zhumakadyr kyzy tells me about the various charges that attracted the death penalty: reading forbidden books, selling drinks, making inappropriate statements, espionage. But the current government has no interest in looking into these matters. 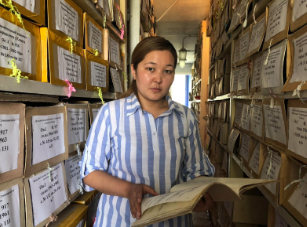 The Issyk-Kul archive holds 20,000 cards issued to people arrested or interrogated, but archive staff have so far only managed to classify a quarter of them. After the opening of the Ata-Beyit complex, Bubyira Kydyraliyeva was allocated a one-room flat on the eighth floor of a building in a Bishkek housing estate, but she actually lives at a dacha in Karakol left to her by her brother. She lives alone, grows apples and soft fruit and sells her harvest to her neighbours. Bolot Abdrakhmanov headed the KGB archive for 15 years; he has now retired and is busy with a PhD thesis. After spending all these years researching the archives, he is writing a book containing the names of 20,000 victims of Stalin’s “Great Terror”.